I realized through one of your comments that the M&M wreath requires a lot of M&Ms (104 - 78 green and 16 red). 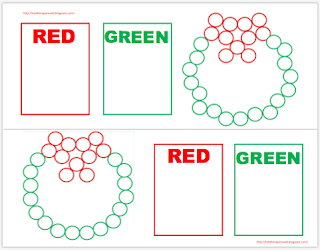 I also know that some of you are teaching preschool, and that doing a project like this would not be economical - so I created a smaller version (only 38 M&Ms required - 27 green and 11 red) just for you! You can find the template here at Scribd. Your advent activities look adorable. We'd love to be included! Thank you so much! Using this for a preschool lesson tomorrow.